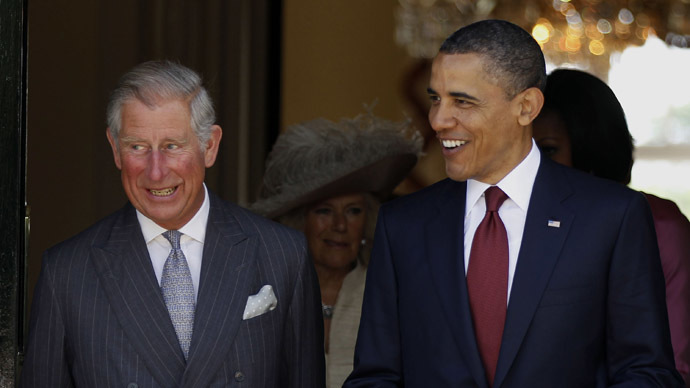 Heir to the throne Prince Charles is set to discuss his appraisal of powerful Arab royal families during talks with US President Barack Obama at the Oval Office on Thursday, as the finale of an overtly political trip to Washington. During a tour of the Middle East in February, the Prince of Wales met Arab rulers in Jordan, Kuwait and Saudi Arabia. As a result, he is seen by the British government as well-placed to offer the US administration counsel on important factors relating to the troubled region’s stability. In separate meetings on Capitol Hill, Prince Charles will also meet the US Senate’s foreign relations committee and Republican chief Mitch McConnell. While sources report there is no specific agenda for the scheduled talks, Her Majesty's Ambassador to the US, Sir Peter Westmacott, said the meeting with Obama will be a “meaningful discussion” in which Middle Eastern politics may well surface. “It’s a very critical issue with [the] Islamic State,” Westmacott told the Guardian on Wednesday. The White House meeting in the president’s Oval Office occurs at a particularly difficult time in UK-US relations. British foreign policy has come under fire from US officials over the UK’s decision to back a Chinese-led development bank. Much to the American administration’s irritation, Australia has also suggested it may follow the UK and New Zealand’s lead in becoming a member. Concerns have also reportedly surfaced in Washington that the British government has taken a peripheral role in peace negotiations relating to war-torn Ukraine. Speaking to the Guardian, Westmacott acknowledged British and US strategists’ divergent views over whether Britain was wise to join the Asian development bank. The move sparked a rare snub from the White House in light of the bank’s perceived threat to the Washington-headquartered World Bank. Nevertheless, Westmacott suggested support from other European allied states for the Asian bank is evidence of a multi-polar world. Westcott, who became British Ambassador to the US in 2011, said the British government’s outlook on China differs to that of the US administration. “There is a slight philosophical difference in that the Brits in particular – the prime minister and George [Osborne] – take the view that China is out there and you have got to engage with it,” he told the Guardian. “But they are dominant too in the World Bank, so this is a bit of a turf box thing,” he added. Shortly before his trip to the Middle East in February, it emerged the Prince of Wales allegedly wants to end his role as a promoter of British arms in Gulf States. The revelation came in an unauthorized biography documenting Prince Charles’ life. It was written by Catherine Mayer, an American-born, London-based journalist. While the government publicly decries the Assad regime and other rebel groups responsible for grave atrocities in Syria, UK government policy has compounded the situation, Nineham said. Despite a recent cooling of UK-US relations, the British Royal family is perceived as a bridge between Westminster and Washington. The Prince of Wales’ four-day visit to Washington, organized by Buckingham Palace’s Clarence House, was reportedly suggested by Britain’s Foreign Office. As part of the trip, Prince Charles also gave a speech on Oceanic pollution at a Washington-based conservation event.